The role of the modern CFO not only harnesses financial analysis and insights but also involves supporting and developing strategy, and guiding key business initiatives. A CFO must be versatile and imbued with the talent to meet continually changing circumstances. Communication skills are imperative. A CFO must convey complex financial results and business performance to internal and external stakeholders, ensuring that communicating with senior executives or shareholders is not hit-or-miss exercise. The current choices are limited to a sea of numbers using tables of data, a PowerPoint slide deck with too many slides, or selective charts and tables that fail to narrate the right story for the audience to hand. We all know that glazed-eye look of an audience trying to push its way through the wall of information to get to the central message. Consider the situation in reverse: it’s now you who is receiving a large volume of data that you can’t interact with or drill down into areas pertinent to your needs. As a C-level executive, how often do you receive reports that fail to present the information you need in a timely and useful form? And how often do you need to ask your own teams to represent their results in an easily digestible form? Visual images are processed in the brain 60,000 times faster than text. The popularity of social media apps manifestly demonstrates the power of visual messages. They are a critical asset for gaining insights from presented information, for avoiding mistakes, spotting anomalies and simply getting across your narrative. For the past 20 years the financial markets have remained locked in a mode of presenting tabular data, static charts, or fixed dashboards. Click on the videos (below) to see animated visuals, not static pictures. 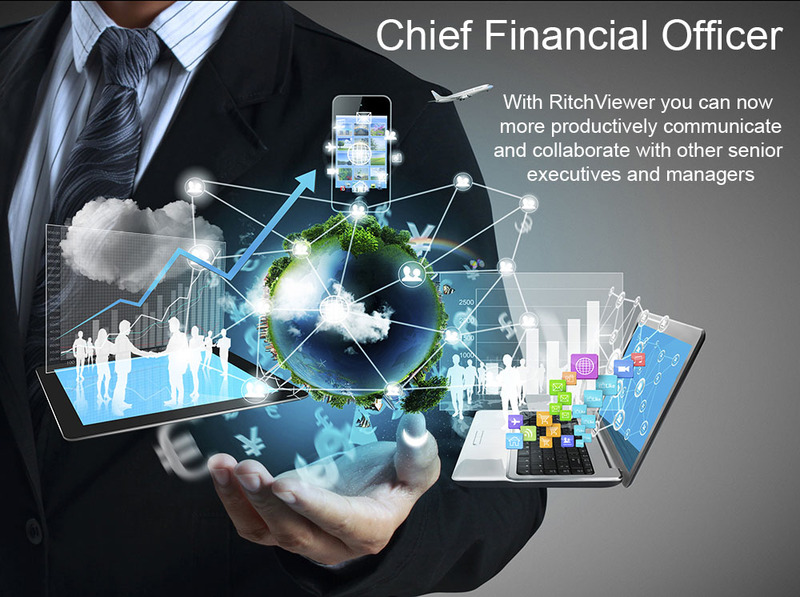 You’ll readily see how RitchViewer can animate your data and deliver to deliver insights. It can help you to get noticed from the pack. 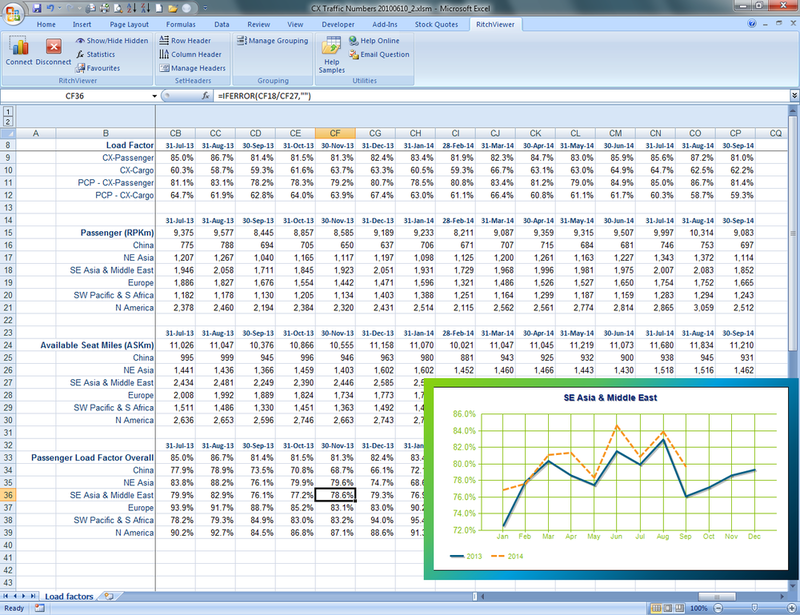 Below are examples of animation of financial or operational spreadsheets using RitchViewer to both explore data, and communicate via interaction to achieve message goals. It starts with a standard template used by a hedge fund manager to seamlessly compare large numbers of listed companies at the press of a button to retrieve the data and, with RitchViewer, navigate through the interrelationships to deliver a compelling story. 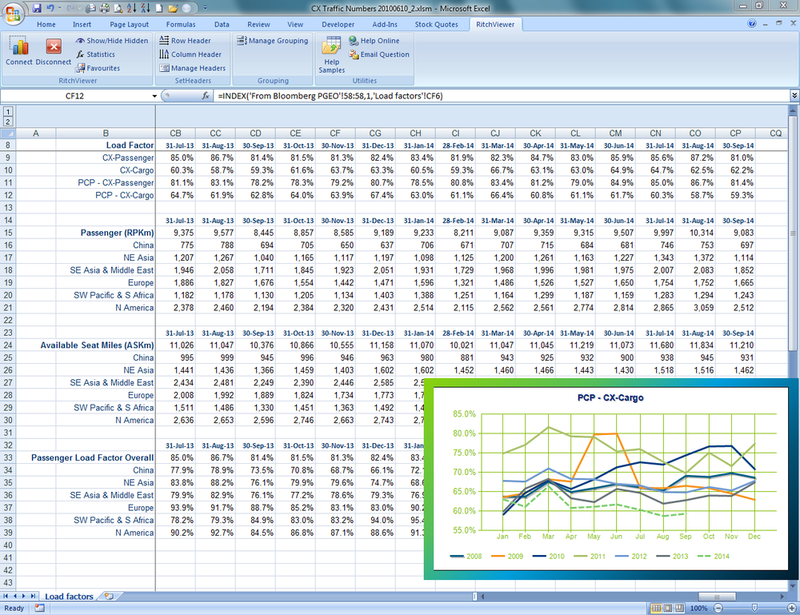 The next example is using RitchViewer to walk through Cathay Pacific's airline statistics over time and across regions. Don't forget to watch the videos earlier on this page and buy RitchViewer Finance Pack to see how you can better communicate complex financial strategy, results and business performance to internal and external stakeholders.